The spinal cord transmits information between the brain and the rest of the body. Injury to the spinal cord, which currently affects some 333,000 Europeans, can cause paralysis, and there is currently no effective treatment. Could stem cells help? The spinal cord is a collection of millions of nerve cells (neurons) inside our spine that sends signals to and from the brain. Damage to this important and delicate tissue is often permanent and can result in paralysis. There are presently no effective treatments for restoring spinal cord function. However, several current clinical studies are testing the safety and effectiveness of stem cells as treatments. These treatments hope to at least partially restore function to the spinal cord. Several studies have shown promising results, but definitive outcomes are still unknown. Inflammation and toxins released by damaged cells at the site of a spinal injury often cause further harm to surrounding cells. Researchers are developing treatments that reduce inflammation and soak up toxins and free radicals to minimise additional damage. Spinal cord injuries often damage neurons and the supporting cells that wrap & insulate neurons. Damaging the supporting cells can cause otherwise functional neurons to die. Researchers are studying how stem cells might be used to replace neurons and their supporting cells to greatly improve a patient’s chances for recovering function. Most stem cell treatments presently in clinical trials rely on transplanted stem cells to automatically repair damaged areas of the spinal cord. It’s not known how reliable and reproducible this treatment will be for different patients and types of injuries. Stem cell treatments for spinal cords are thought to work best if offered in the short time-frame after an injury. Scarring at the site of injury can hinder the effectiveness of a treatment, so this also needs to be addressed. It isn’t yet clear how much function can be restored with the stem cell treatments presently in clinical trials. How are spinal cord injuries treated now? How could stem cells contribute to spinal cord repair? Can stem cells be used to treat spinal cord injuries now? 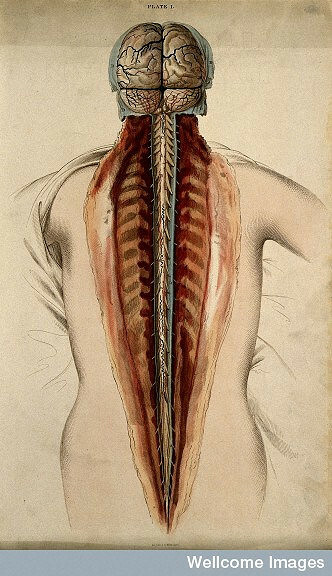 The spinal cord is the delicate tissue encased in and protected by the hard vertebrae of the spinal column. Together the brain and spinal cord form the body’s central nervous system. The spinal cord is made up of millions of nerve cells that carry signals to and from the brain and into other parts of the body. This information allows us to sit, run, go to the toilet and breathe. The main cell type found in the spinal cord, the neuron, conveys information up and down the spinal cord in the form of electrical signals. An axon (also known as a nerve fibre) is a long, slender projection of a neuron that conducts these signals away from the neuron's cell body. Each neuron has only one axon, and it can be as long as the entire spinal cord, up to 45cm in an adult human. The axons that carry messages down the spinal cord (from the brain) are called motor axons. They control the muscles of internal organs (such as heart, stomach, intestines) and those of the legs and arms. They also help regulate blood pressure, body temperature, and the body’s response to stress. The axons that travel up the cord (to the brain) carry sensory information from the skin, joints and muscles (touch, pain, temperature) and from internal organs (such as heart and lungs). These are the sensory axons. Neurons in the spinal cord also need the support of other cell types. For example, cells called oligodendrocytes increase the speed and efficiency of electrical signalling of axons by forming myelin - structures that wrap around and insulate the axon. Spinal cord injuries are devastating and debilitating conditions affecting people all over the world, particularly young adults. They are associated with severe physical, psychological, social and economic burdens on patients and their families. To develop effective treatments for spinal cord injuries, a precise understanding of the main events following the injury and how these events interact is needed. Spinal cord injuries generally involve two broad chronological phases that are sustained by the primary and secondary mechanisms of injury. Primary injuries include shearing, laceration, and acute stretching. Acceleration–deceleration events can also cause spinal cord injury, but very rarely lead to complete disruption of the spinal cord. At a cellular level, axons are crushed and torn, and oligodendrocytes, the cells that make up the insulating myelin sheath around axons, begin to die. 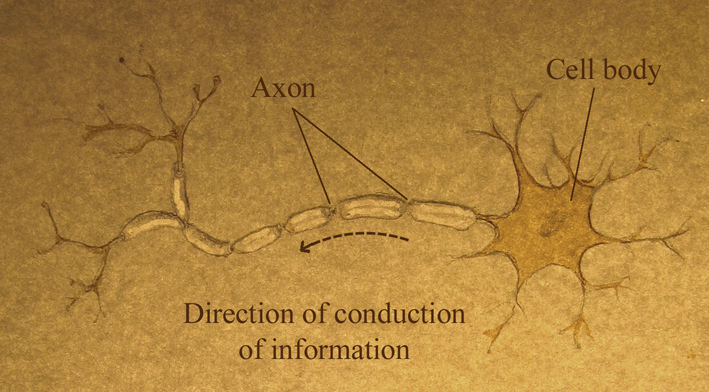 Exposed axons begin to degenerate, which disrupts neuron connections and the flow of information along the spinal cord. The spine has different sections. The level of paralysis depends on the location of the injury. The body cannot replace cells destroyed by spinal cord injuries, which is why these injuries often lead to permanent movement and sensation impairments. Many spinal injuries result in patients being paralyzed and without sensation from the level of the injury downwards. Injuries high in the neck, such as that suffered by Superman actor Christopher Reeve, paralyze the whole body including the arms and shoulders. 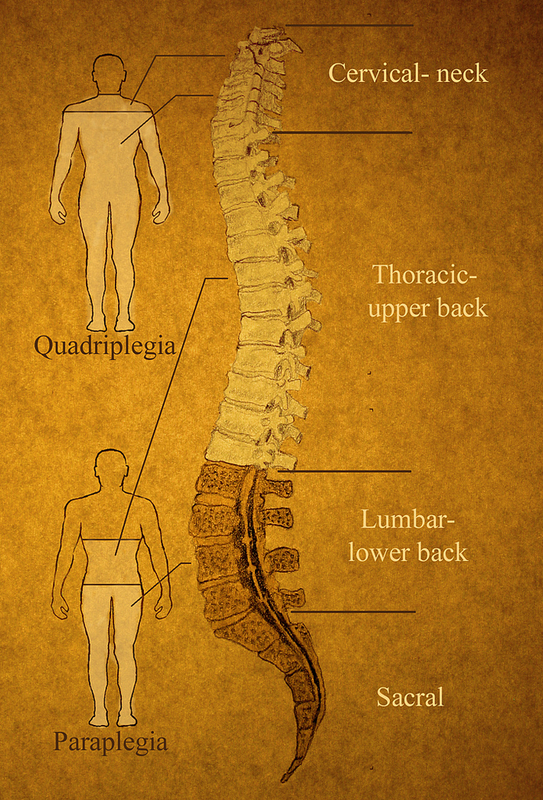 A common level of injury is just below the ribs, resulting in normal arm function but paralyzed legs. Depending on the location and the extent of the injury patients may suffer complete or incomplete paralysis, and loss of feeling, sexual function and bowel control. The severity of neurological injury, the level of the injury and the presence of a zone of partial cord preservation are accepted predictors of recovery and survival after spinal cord injuries. The presence of spared axons crossing the injury site holds great therapeutic potential, and is the basis of a number of emerging therapeutic strategies. Despite the important advances in the understanding of spinal cord injuries, to date, almost all therapies that have shown promise at the preclinical stage of study have failed to translate into clinically effective treatments. Medical care immediately after the injury – including immobilising and bracing to stabilise the spine - can help to minimise the damage to nerve cells. Rehabilitation can help patients regain physical and emotional independence. A spinal cord injury is complex, involving different kinds of damage to different types of cells. The environment of the spinal cord changes drastically during the first few weeks after injury (immune cells flow in, toxic substances are released, a scar is formed). A combination of therapies is needed, acting at the appropriate time-point and on the correct targets. Different cell types, including stem cells, from a variety of sources, including brain tissue, the lining of the nasal cavity, tooth pulp, and embryonic stem cells, have been tested in these studies – mostly conducted in rat models of spinal cord injuries. None of these cells have produced more than a partial recovery of function, but it is an active area of research, and several different types of stem cell are being tested and modified. Allogeneic (single donor) neural stem cells are being investigated for their potential in treating spinal cord injuries. There are several clinical trials examining human neural stem cells in spinal cord injuries (see clinicaltrials.gov). These trials inject neural stem cells directly into the spinal cord with the hope that the cells help re-establish some of the connections between neurons and create the necessary cells to support both the old and new neurons. In December 2010 the Swiss regulatory agency for therapeutic products approved a StemCell Inc. sponsored Phase I/II clinical trial on chronic spinal cord injury at the Balgrist University Hospital in Zurich (Switzerland). The trial used specific stem cells derived from human brain tissue (neural stem cell or NSCs), which can make any of the three major kinds of neural cells found in the central nervous system. The trial was based on preclinical evidence that oligodendrocyte cells were replaced after transplanting human NSCs into in a particular mouse model for spinal cord injuries. For the trial, human NSCs (specifically referred to as Human Central Nervous System Stem Cells or HuCNS-SC) were directly implanted into the spinal cord of patients with complete and incomplete chronic thoracic spinal cord injuries. This trial was officially completed in June 2015 (clinicaltrials.gov identifier no. NCT01321333). In 2012 a further Phase I/II clinical study of HuCNS-SC cell transplantation was started with 12 subjects (clinicaltrials.gov identifier no. NCT01725880) and in 2014 another clinical trial was started to test the safety and efficacy of HuCNS-SC transplantation in cervical spinal cord injuries (clinicaltrials.gov identifier no. NCT02163876). After having treated 12 patients in the NCT01321333 phase I/II trial and additional 31 in the NCT02163876 phase II trial (total 43 patients) the company reported no serious adverse effects. However, Stem Cell Inc. prematurely terminated its stem cell programmes in 2016 following an in-depth review of data from these studies. The outcomes appear to have been safe, but were not as effective as the company was aiming for. Stemcells Inc. is the second high-profile cellular therapy developer to fall short in the highly challenging neural therapies space in recent years. More information on this study – press release from Stemcells Inc. In 2014 Neuralstem began a Phase I safety trial of its NSI-566 neural stem cells for chronic spinal cord injury at the University of California, San Diego School of Medicine (clinicaltrials.gov identifier no. NCT01772810). This trial uses the same cells and a similar procedure as the company’s Amyotrophic Lateral Sclerosis (ALS) trials (the first FDA-approved neural stem cell trial for the treatment of ALS). The 2014 trial will include a total of 8 patients, four of whom have thoracic spinal cord injuries causing complete loss of sensory and motor function. This trial is currently recruiting with an estimated completion of treatments in 2018 and study results in 2022. The Miami Project clinical researchers currently have several clinical trials and clinical studies available for people who have had a spinal cord injury; some are for acute injuries and some are for chronic injuries. The clinical trials are testing the safety and efficacy of different cellular, neuroprotective, reparative, or modulatory interventions. These include a Phase I clinical trial with patients’ own myelinating cells, cells derived from the peripheral nervous system Schwann cells (clinicaltrials.gov identifier no. NCT01739023). The Miami Project is also sponsoring a Phase I clinical trial of autologous human Schwann cell (ahSC) transplantation in participants with chronic spinal cord injuries (clinicaltrials.gov identifier no. NCT02354625). While the former trial was completed in 2017, the latter is currently recruiting - approximately until January 2019. Mesenchymal/stromal stem cells are being investigated as possible treatments for spinal cord injuries. Clinical Trials (clinicaltrials.gov) identifies at present total of 16 trials tagged as MSC trials in spinal cord injuries. These include studies that investigate the safety and efficacy of MSCs derived from the patient’s own bone marrow (9), adipose tissue (fat) (5) or cord blood (2). MSCs are injected in a number of different ways in these trials - including directly into the spinal cord or the lesion itself, intravenously, or even just in the skin. The hope is that when transplanted into the injured spinal cord, these cells provide tissue protective molecules and help to re-establish some of the circuitries important for the network of nerves (indirectly from cell integration and differentiation). More information can be found here. California based biotech Geron had a widely reported clinical trial under way for a treatment – the first of its kind – involving the injection of cells derived from human embryonic stem cells. 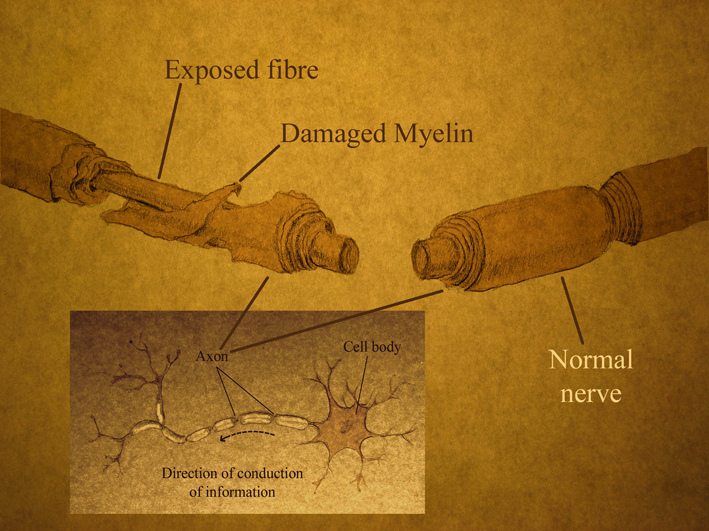 The injected cells were precursors of oligodendrocytes, the cells that form the insulating myelin sheath around axons. Researchers hoped that these cells, once injected into the spinal cord, would mature and form a new coating on the nerve cells, restoring the ability of signals to cross the spinal cord injury site. After treating four patients with these cells in a Phase I clinical trial and reporting no serious adverse effects, Geron announced in November 2011 it was discontinuing its stem cell programme. The company said “stem cells continue to hold great promise”, but cited financial reasons for shifting focus to other areas of research. Following up on the cellular technology initially developed by Geron, Asterias Biotherapeutics has developed a program that focuses on treating spinal cord injuries with specially developed oligodendrocyte progenitor cells (OPCs), precursors of oligodendrocytes. 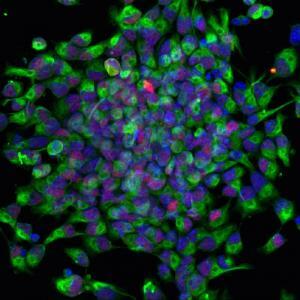 These cells, known as AST-OPC1, are produced from human embryonic stem cells. The hope is that when transplanted into the injured spinal cord abruptly after injury (7-14 days), OPCs may re-myelinate and restore lost functions. In a Phase I clinical trial, five patients with neurologically complete, thoracic spinal cord injury were administered embryonic stem cell-derived OPCs at the site of injury. Delivery of OPCs was successful in all five subjects and no serious adverse events were associated with either the administered cells or the accompanying immunosuppression regimen. In four of the five subjects, MRI scans suggested a reduction in the volume of spinal cord injury. A second follow up (dose escalation) Phase I/II trial with AST-OPC1 in acute (14-30 days after injury) sensorimotor complete cervical spinal cord injuries is currently recruiting participants (clinicaltrials.gov identifier no. NCT02302157). ClinicalTrials.gov contains the most up to date information about current clinical trials, as well as links to result information. The European Spinal Cord Injury Federation has a list of clinical trials aimed at the regeneration of the spinal cord and functional repair after spinal cord injury. No. Although, stem cells are very useful in spinal cord injury research and are beginning to be tested in clinical trials, there are currently no proven and approved stem cell treatments available for spinal cord injuries. Several different approaches and types of stem cells are being investigated for their potential use in future treatments. Depending on the type of stem cell and the way it is implanted, the aim of the various strategies is to bridge the injury so that axons can regenerate, to replace lost myelin, and to protect the cord from spreading damage after the injury. It is likely that we will see further clinical trials based on these strategies. This fact sheet was created by Kate Doherty. Reviewed in 2012 by James Fawcett. Reviewed in 2015 and 2018 by Stefano Pluchino. Lead image by Wellcome Images. Drawings by Cameron Duguid. Neurons by Joshua Bernstock, Dept of Clinical Neurosciences, Wellcome Trust-Medical Research Council Stem Cell Institute, University of Cambridge (UK). Young men are most likely to suffer a spinal cord injury: 80% of patients are male, the average injury age is 33, and the most common age of injury is 19 years old. The spinal cord is made up of millions of nerve cells. Neurons (shown in white) are the main cell type found in the spinal cord.